See where you can park for upcoming events and activities at the U of R's Main and College Avenue Campuses. 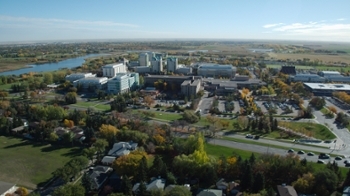 The University of Regina's main campus is located in southeast Regina, just off the Ring Road at the corner of Wascana Parkway and Kramer Boulevard. For street addresses of individual buildings, please see Buildings: A-Z or view the official campus map, below. Campion College, the First Nations University of Canada, and Luther College, are located on or adjacent to the Main Campus. Use the official campus map for detailed location and street information. This map includes locations for accessible, motorcyle and bicycle parking in addition to designated smoking areas, service areas and central receiving. An experimental app is available for navigating between and inside buildings at the University of Regina main campus. Download URMaps - 2018 Experimental Version app from Google PlayStore. Select "View Mobile Map in Full Screen Format" to see the map in full screen format. Select "Hybrid" to see satellite imagery view with street names. The Main Campus is situated on the shores of Wascana Lake, so you can take the multi-use pathway system through Wascana Centre to get to class. Plan your route by checking the map for the pathway system on the city website. Check the official campus map (PDF or JPG formats, above) for locations of bike racks on campus. Regina Transit offers both regular and express bus service to the University of Regina. To learn more about these bus routes and to download a bus schedule, go to Transit Services on the City of Regina's website. If you drive to the U of R's main campus, you will need to pay for parking. Parking and Transportation Services' website has information about rates for meters, lot fees, daily parking permits and semester parking permits. 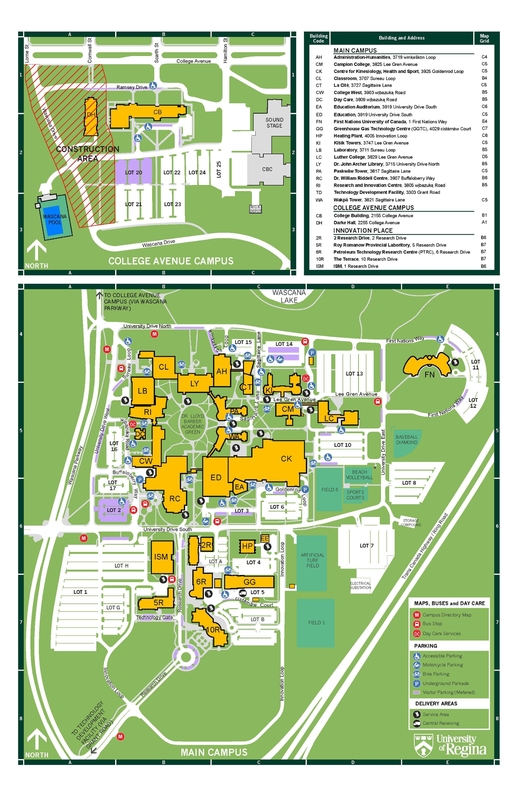 The locations for accessible parking, motorcycle parking, bicycle parking and visitor parking (hourly meters) can be found on the official campus map (PDF or JPG formats, above).